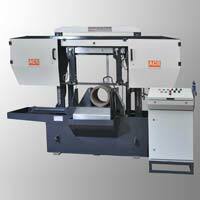 Our range of semi automatic Semi Automatic Double Column Bandsaw Machines are acknowledged for their high performance and sturdy construction. The entire gamut is available in various technical specifications. Anti friction LMG guided double column construction. Hydraulic job clamping & blade tensioning. Double clamping vice. Material is clamped on both sides of saw blade. Automatic height adjustment to save ideal time.